The VERSION file in the config folder shows 2.4.13. How can I fix this? When you actualised the database by hand and loaded all the files up to the server, the forum should be in the actual state. You obviously forgot to execute the last step of every update per script. 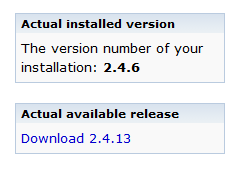 It's the actualisation of the version number (nowadays with the value from the file VERSION). Please set the actual version number in the setting field version. Go to the admin panel, then to "forum settings" and follow the link to the "advanced settings" below the settings form. The setting version is the next to last row in the settings form table. Value should be "2.4.13". Please share any information you remember about the failed upgrade attempt. It's really seldom that an upgrade failed, but maybe there is something we can make better. "Error in line 291: The version you want to install (see string in config/VERSION) must be greater than the current installed version. Current version: 2.4.6, version you want to install: 2.4.6. Please check also if you uploaded the actual file version of config/VERSION. Search therefore for the file date and compare it with the date from the installation package"
config/VERSION said 2.4.6, and it worked when I changed it to 2.4.13. Perhaps it should be included in the instructions that you have to change config/VERSION to the version you want to install to as well? config/VERSION said 2.4.6, and it worked when I changed it to 2.4.13. So far so good. The eror message led you to the necessary check what led you to the solution. Perhaps it should be included in the instructions that you have to change config/VERSION to the version you want to install to as well? Ah, no and yes. The wiki page about updating states the necessity of using the file config/VERSION from the package one wants to upgrade to. But on the other hand you are right, the readme could contain a section about the updating process as well and therein the use of the actual file config/VERSION should be mentioned as a mandatory requirement for the update/upgrade.